← Living Together Face-off AND an Exciting Announcement! I actually did pretty well at Home Depot; I got all the stuff I needed at a very low cost. The good thing about this project is that it sort of requires you to buy cheap crap! 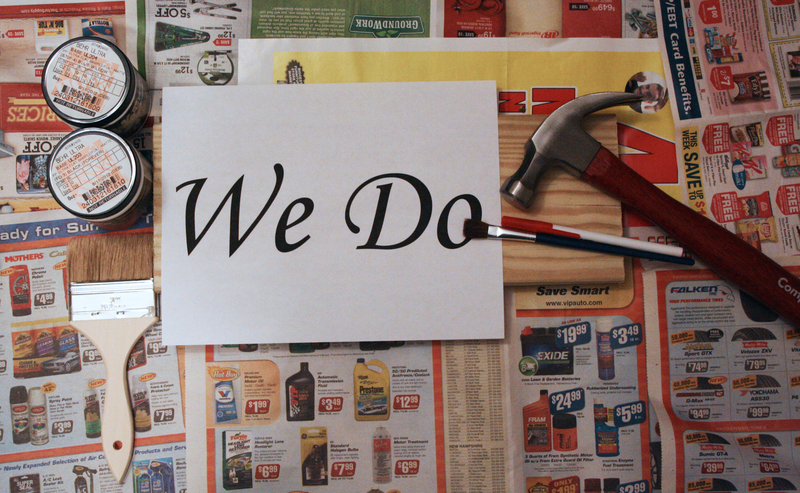 You are making a rustic sign out of new materials, so the cheap stuff actually works best! All in all this will cost you about $15-$20. It cost me just over $10 but that’s because I lucked out with some of the materials. 2) Acrylic NON-glossy paint, color of your choice AND black paint…my suggestion is to go with a light color for the background where the black will pop against it! I went with a grey-ish blue. Here is where you can save a little money, paint stores or home improvement stores often have colors that weren’t mixed correctly or very cheap sample paint. I got three jars of sample paint for about $6. 3) Block o’ wood…I went with something that looked sign-like HOWEVER here is where I lucked out. Home Depot had this wood lying around that they were going to just throw away. It hadn’t even ended up in the scrap wood pile, so they just gave it to me for free. Right place right time! Gotta love it! 4) Cheap & nasty brush. No need for fine art top o’ the line paint brushes! You need a brush that will fall apart as soon as you buy it. 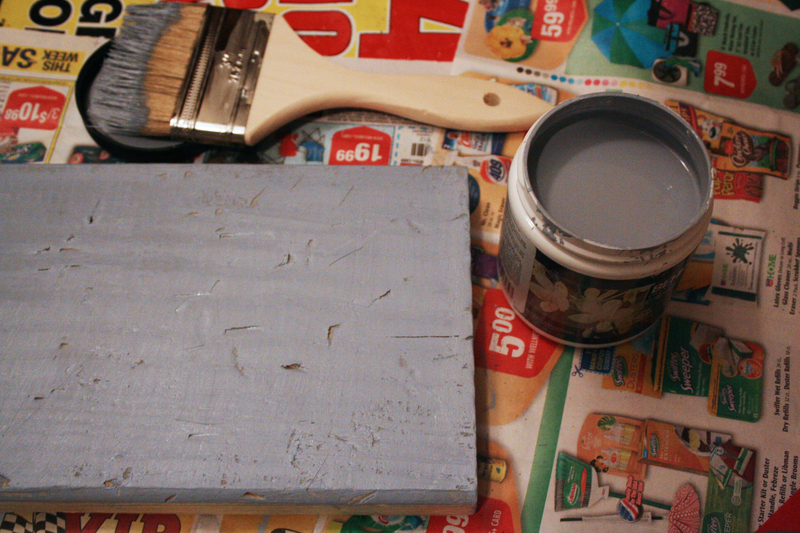 The crappy brush will make your paint job look sort of rustic and old. 5) Small, decent, paint brush. This one needs to be a little better quality and rather small. The size pictured there worked for me, but I would have preferred something a little smaller. 6) Pen, sharpie, the end of a paint brush, anything with a hard, dull edge. You will use your pen/sharpie with the cap on to press against the wood. 7) Printed out paper with your words or image on it. I used an ink jet. I’m not sure if a laser printer will work, try it and let me know! Now the idiot in me did something HORRIBLY wrong when I took this photo…the letters are the wrong way! In order to transfer them to the wood you need to print them out backward! Don’t make my mistake!!! PRINT YOUR WORD(S) OUT BACKWARD! I used Photoshop, but I’m sure Word can work too! 8) LOTS of newspaper or, in my case, junk mail, to put down on the rug OR do this outside. It’s the one time storing up junk mail in my car worked for me. Start by taking the claw end of your hammer and really going to town. This is a great project to work off any wedding stress you may be facing! Hack and bang away on all sides of the board until it’s as worn and beat up as you like it! Now you can start painting. 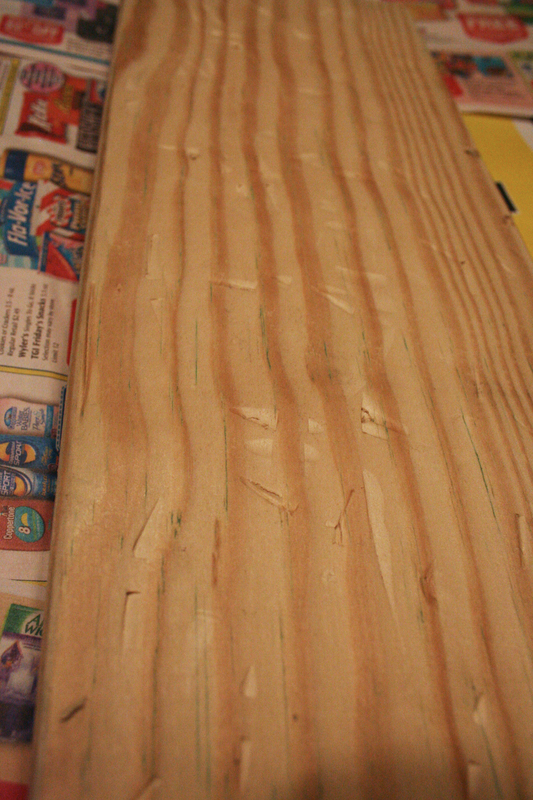 Take your lighter color paint (or the not-black paint) and paint your entire board. Once both sides are painted and dry, it’s time to transfer the lettering. 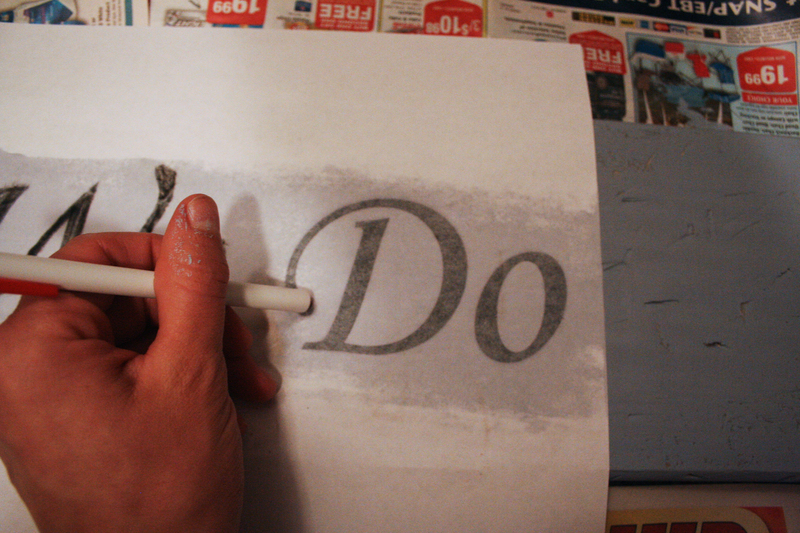 Place your paper face down (this is why the wording needs to be backwards) where you want it on the wood, wet your brush (after you’ve washed the paint off of it) and ring it out. *I used a sponge brush but you don’t have to. * You want the paper to be damp, not soaking wet. This is when the ink in the paper transfers over. 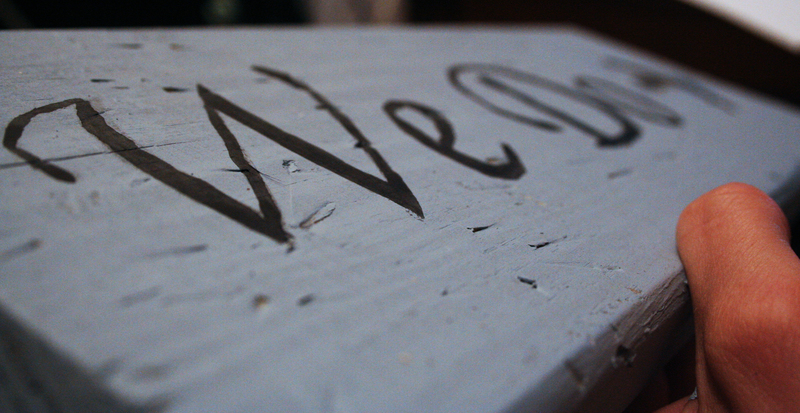 With the paper wet, and still on the wood, take your pen/sharpie/paint brush end, and trace over your letters, making sure all of the ink gets pressed into the paint. Here you need to be delicate and firm at the same time. You want to press the ink into the paper, but you don’t want to rip the paper. However, if it does rip, not the end of the world…just don’t scrape around that area anymore. Now you can peel the paper off! It looks SUPER rustic for sure! If you want to keep it this way, by all means! 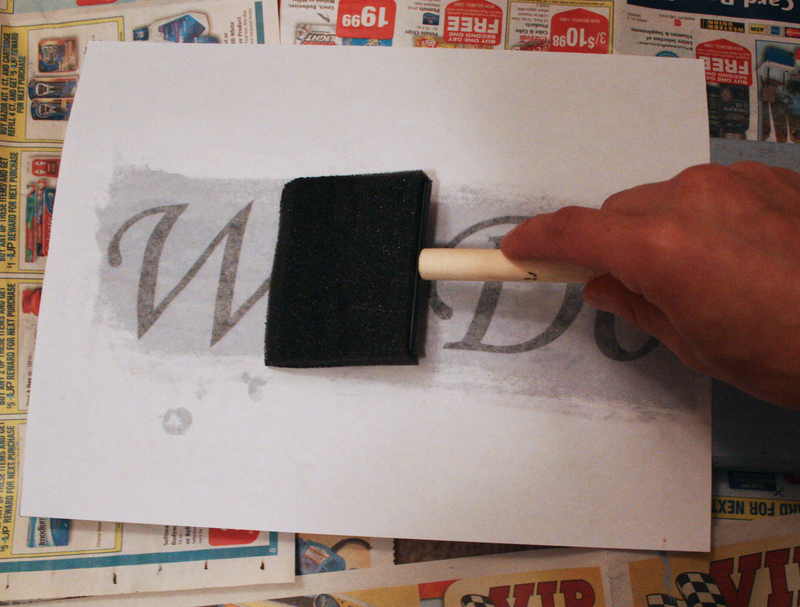 However, if you prefer your letters to be a bit darker, this is where the black paint and a steady hand comes in. First take some of your black paint and dilute it with water. You can choose to make it as light or dark as you want…I just guessed. If you want, paint a little arrow showing where “You Do” (tee hee). And you are all done! For good measure I wrote the same thing on the other side with the arrow pointing the other way…mainly because I’m not sure how everything is set up yet…so it is beneficial to do both sides. So if you finish both sides then you are REALLY done! Attach to a sturdy stake to go in the ground and Voila! 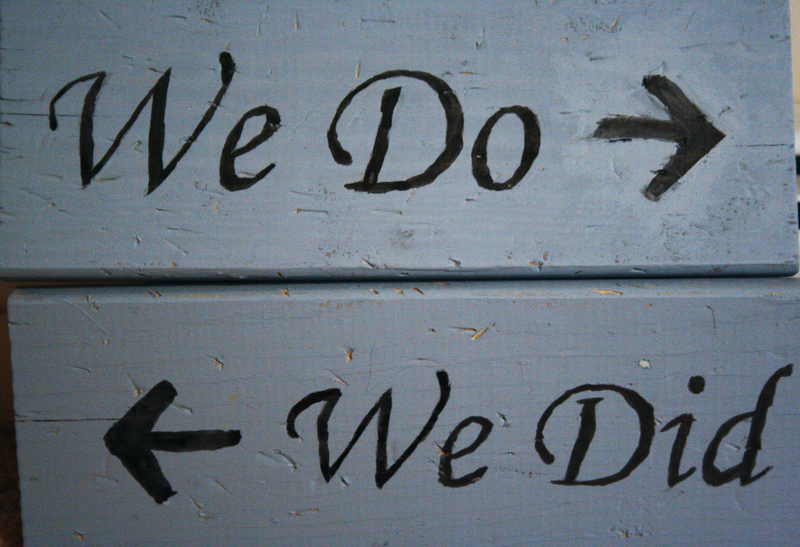 I LOVE the “We Do” and “We Did”!!!! Great idea! Thanks! It was totally the boy’s idea!